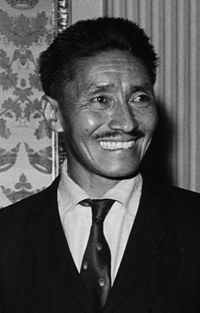 ↑ "Tenzing Norgay and the Sherpas of Everest - Sherpa Tenzing Norgay Nepalese Mountaineer- Information on Tenzing Norgay". tenzingasianholidays.com. Retrieved 2 March 2014. ↑ 2.0 2.1 Douglas, Ed (24 December 2000). "Secret past of the man who conquered Everest". The Observer. Retrieved 22 August 2014. ↑ Webster, Ed (2000). Snow in the Kingdom : my storm years on Everest. Eldorado Springs, Colorado: Mountain Imagery. ISBN 9780965319911. ↑ Rai, Hemlata (30 May 2003). "The Fortunate Son" (PDF). Nepali Times. Retrieved 22 August 2014. ↑ Das, Sujoy (6 April 2014). "Sixty years of the dream conquest". The Telegraph, Calcutta. Retrieved 22 August 2014. ↑ "Honours: Honours for Tenzing". 7 October 2014.